We’ll take career advice from our role models any chance we can, which is why Fashion for Breakfast is one of our favorite events. The bimonthly meetup is hosted by Soho House at the ultra-trendy restaurant Cecconi’s, in cities around the world. Every edition features stylish (and successful) fashion industry personalities speaking about their career journeys, canvassing both their mistakes and their greatest achievements. When we found out entrepreneur and jewelry mogul Kendra Scott would be hosting several of the upcoming meetups, we had to get a seat at the table. Ahead, take a peek inside the NYC and Los Angeles events. 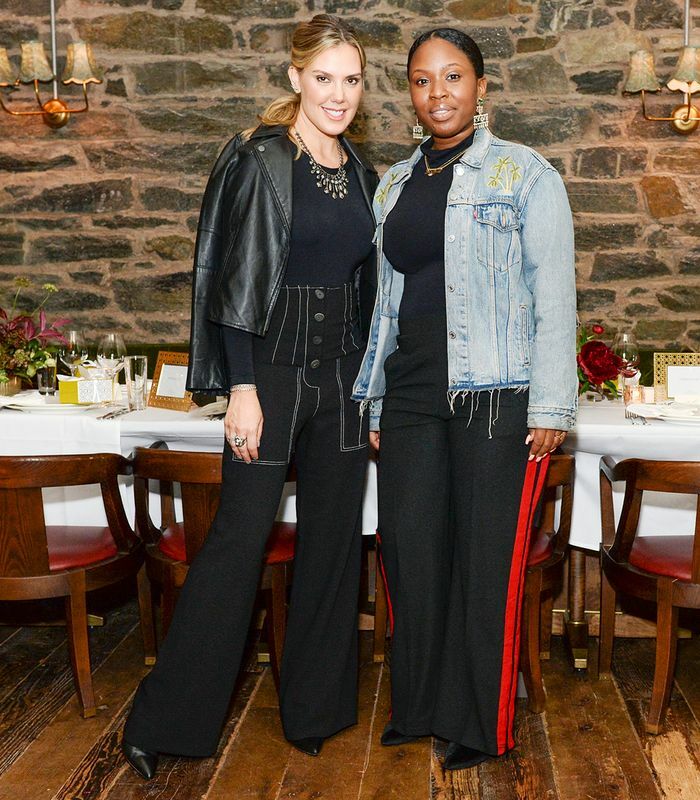 For her NYC Fashion for Breakfast event, Kendra Scott opted to host an intimate dinner for a dozen up-and-coming businesswomen working in fashion, entertainment, and beyond. She was in New York to speak on a panel at the WWD Apparel & Retail CEO Summit, so it was fitting that the roundtable conversation focused on the various guests’ perspectives on being women in the business world. Given that Scott started out with only $500 in her bank account, it was inspiring to hear how the successful entrepreneur got to where she is today. Scott and Jennifer Pauline from Soho House prove that statement jewelry is worth investing in for fall. Our guests brought their style A game to the dinner table. There was no shortage of trends—we spotted everything from a sheer lace blouse on clothing designer Christine Alcalay to athleisure trousers on IMG creative Zareen Helaly. We love these uptown-versus-downtown takes on weekend denim looks à la Juliana Salazar and Ariana Margulis. The setting for the dinner was lovely, including chic metallic frames from Kendra Scott. Now this is how you add edge to a white button-down like true NYC girl, TyLauren Gillmore. We know exactly what we’ll be buying our friends for the holidays: chic statement jewelry from Kendra Scott. At the Los Angeles event, Soho House’s Jennifer Pauline led a Q&A with Scott and our very own Hillary Kerr. Both women are true forces to be reckoned with, and they had no shortage of inspirational words for the fashionable crowd. They spoke about the importance of building a strong team, being kind to everyone you meet, and understanding that success does not happen overnight. Below, get an inside peek from the stylish event (and some career advice courtesy of Kendra Scott). Fashion for Breakfast attendees always show up in the chicest outfits, and this event was no exception. Before Kerr and Scott took the stage, the stylish guests dined on avocado toast and lots of coffee. The always stylish FFB host Jennifer Pauline proved that a tailored black blazer can polish up any dress. We almost can’t believe that Scott went from having $500 in her bank account to creating an accessories empire (she made Forbes’s 2017 list of wealthiest self-made women). Hearing her story was not only fascinating but inspiring. Her explanation for her company’s success? “I always hire on character over experience,” she tells us. Besides being a kind team player, Scott says the best advice for entrepreneurs-to-be is to create something that you personally would use or want. The tablescapes received some Kendra Scott frames (perfect for your console table at home) and canary-yellow gift boxes filled with baubles from Kendra Scott’s fall line. Don’t mind if we do. We love the way Scott put a spin on her classic floral dress by teaming it with a modern belt. Kerr further convinced us that floral prints are fall-appropriate with her chic kimono. Next, learn more about Kendra Scott’s ultra-successful brand and then check out her new jewelry collection.